Imagine a flying site which is so reliable you can almost guarantee it will be flyable. Sounds almost perfect, doesn’t it? OK, so let’s see if we can make it better… Let’s add somewhere to stay right by take-off with a friendly vibe where you can lie in a hammock in the shade watching the sky until the conditions are just right for you. Is that perfect yet? Well, almost. But let’s throw in breakfast, unlimited good coffee, retrieves, and radio support from two excellent instructors, just for good measure. 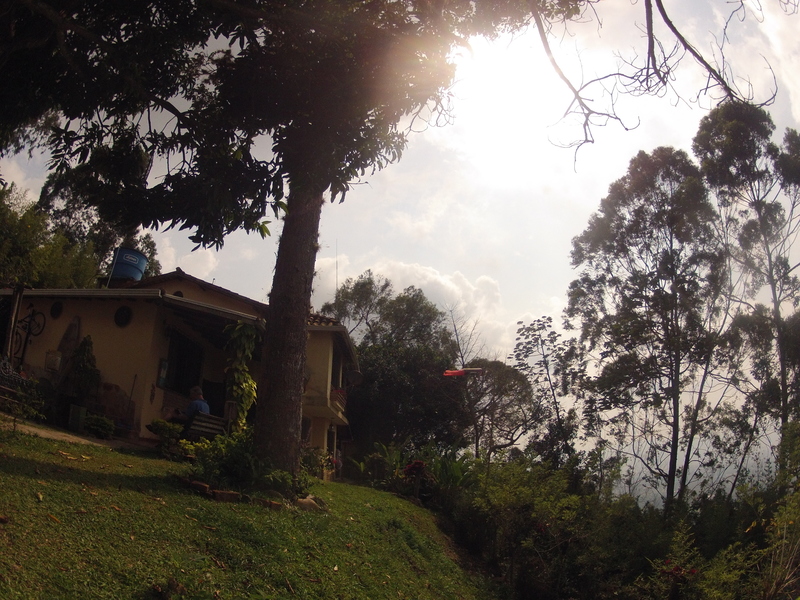 And while we’re imagining our perfect paragliding retreat, let’s set the price. We all know pilots don’t like spending much money, so we’ll chuck in all the extras for free and keep it about the same price as any other hostel in the area. It all sounds too good to be true, doesn’t it? So imagine our surprise when we arrived in Bucaramanga to find exactly that! Getting to Hostel El Nido at 8am, exhausted after a 9-hour night bus ride across Colombia, Sarah, the Colombian lady who runs the hostel, did everything she could to make us welcome, magicking up a couple of extra plates of breakfast for us and pouring the tastiest coffee we’ve found in Colombia down our throats. As we ate our breakfast, we watched the birds exploring the first morning thermals in the valley in front, so we quickly polished off our third coffee and headed out to join them. A badly timed launch on the tandem (neither of us are known for our patience) meant that our first flight can only be described as a brief orientation to the site as we found ourselves in the landing field in no time. 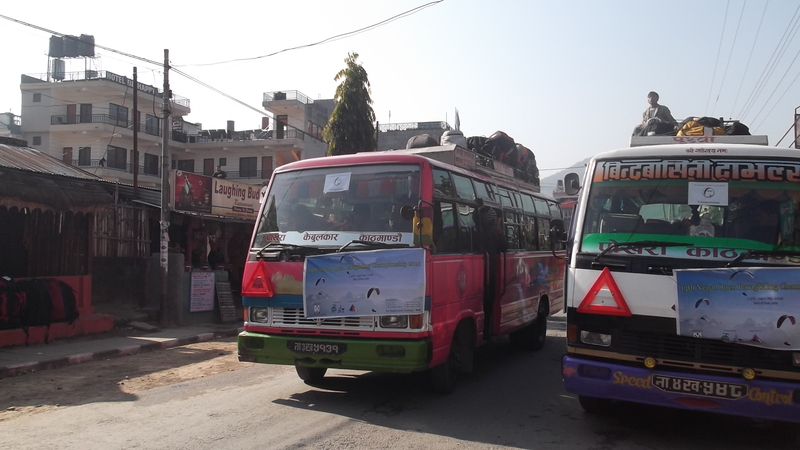 But not a problem – the retrieve van was there waiting for us. Within less than half an hour we were back in the air. This time, staying up was no problem and we were high above takeoff before we knew it and able to explore the area properly. The site tends to blow out in the middle of the day for all but the heavily loaded tandems (there are no skinny tandem pilots here) and those on mini wings. This may not suit everyone, but we found the enforced lunch break welcome setting us up nicely for the evening of soaring and restitution until the sun set. The next day, the same. And again, and again and again! On the one day the weather wasn’t so good, the overcast sky slowed down the thermals, but it was still flyable with enough wind to soar by the end of the morning. 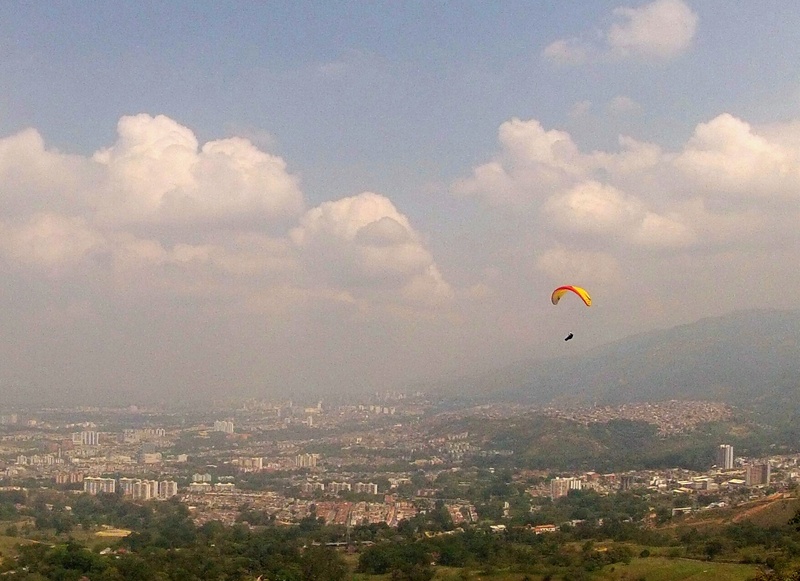 The place isn’t great for XC at the moment thanks to a recent reduction in the air space allowed by nearby Bucaramanga airport. Maybe this will be relaxed again in future? Let’s hope so! But in the meantime, it’s still a great place to practice your XC skills and clock up loads of airtime. The thermals are just boisterous enough to warm you up for the European spring, without being so strong that they throw you around the sky. The flatish land out front gives you the chance to practice identifying thermal sources and joining up thermals. And if you’re wrong, you just land and have another go! You can set yourself little triangles to fly to build your skills. Despite the lack of big distance potential, we certainly found enough to keep us entertained for a few days, so if you’re in Colombia, it’s definitely worth considering adding Bucaramanga to your itinerary! When we’re talking about XC flying, we find the mental stuff often gets the better of people and that people share the same questions and fears. This summer we ran an introduction to XC course in Annecy for a small group of pilots who wanted to do their first XCs and learn enough so they could go on to progress on their own after the course. We talked a lot about the mental side of XC flying. This is every bit as important as the practical flying skills if you want to fly XC. 1) What if there’s nowhere to land? Why would you put yourself somewhere with nowhere to land? XC isn’t just about joining up ridges and thermals, it’s also about flying from one landing field to another. When we’re flying, we’re always looking at landing options and making sure we’ve got a selection of friendly-looking fields in easy reach. Never leave one landing field behind until you’ve got another one within reach! 2) What if I bomb out? Get used to it – you will bomb out! There are lots of ways indications for whether you’ll make a glide – other pilots, you instruments, estimating the angle with your feet, etc. But you’ve got to put it to the test in the end and risk being wrong. If you never bomb out, you’re probably not pushing yourself. Don’t be afraid to fail – you will make mistakes and you WILL bomb out. That’s one of the ways you learn (and often where the real adventure begins!). Everyone does! Fear can be healthy – firstly work out if it’s rational or irrational. Having something to take your mind off it will help when irrational fear strikes. Chewing gum, singing songs, thinking about your shopping list, having something to eat or drink all help. 4) I don’t know where to go! Pimp off others! Other pilots give you some of the biggest clues about what the air’s doing. If you’re not using them to maximise your climb, glide and distance, you’re missing out. BUT don’t follow them until you know they’re going somewhere good (not to work or to pick their kids up from school)! Pilots often lose patience if they have to wait a while for the next thermal or when banging their heads against an inversion. They give up and wander off even if they don’t have anywhere better in mind and end up bombing out. They are often rewarded by getting to watch the other pilots they were scratching with then climb up and carry on while they’re packing their wing! Be patient and don’t give up! Sometime’s it just takes perseverance to hang on until the next thermal cycle or fight your way through an inversion. As long as you’ve got a safe landing in glide, keep fighting! Don’t forget the creature comforts. Have food and water easily available and go for a wee before you launch. Get your harness set up nicely and get familiar with your instruments in a stress free environment. Being uncomfortable in the air is distracting and will have you thinking too much about your landing field. Happy pilots in goal after a challenging sunset task! Make a decision and stick with it! Don’t just bimble around – you’ll either never leave the ridge or just keep changing your mind until you find yourself on the ground. Use all the information available, choose a (safe) route and follow it through. Then you can ask yourself: “Was it the right decision?” You’ll never know and learn if you keep changing your mind. The Ozone Chabre Open finished weeks ago now! The results are in and most people have left Laragne either back home or onto their next adventure. In all we got four full tasks in, from three different launches with many happy pilots in goal every day. It really felt like a fun comp where every pilot could learn something in a supportive environment with just enough friendly competitiveness to keep things interesting. Unfortunately, registration for next year doesn’t start for another 7 months or so, but if I could sign up now, I would! Day 3 was another beautiful looking day, forecast similar to the day before. Initially it looked good for a task to Gap, some 50km to the north east. But cloud development in that direction meant that the task was revised to Aspres again, this time via Beaumont and the Sailplane Ridge. As often happens in the mountains, despite the similar forecast, it was a totally different day! The ridge was scratchy and even seasoned locals like Rachael Evans of Allez-Up had to work hard in dribbly thermals before finally getting something that went up to cloudbase. For me, I let my short attention span get the better of me for the first time in the comp. Frustration at having to scrabble on the ridge, sometimes with quite selfish pilots, led me to make a couple of bad decisions, eventually taking a weak climb too low over the back meaning I couldn’t get back for the first turnpoint on the ridge. So, while I was hearing on the radio talk about the clouds and wind over Beaumont, I was thermalling up high over Orpiere. As the radio reports moved on to clouds over the Sailplane Ridge, I was pushing slowly and patiently forwards trying different routes back to the ridge, still only 1km or so south of the Orpiere ridge. By the time I finally clipped the first turnpoint, Jockey was on the radio warning pilots coming in to land at goal that the field was thermic. I managed to reach the next turnpoint at Beaumont then pushed out to land, as the wind around there and Serres was now too strong for me to carry on safely. Distance-wise, it may not have been an epic flight (16km of the task route). But for me, I was delighted! Losing concentration and giving up too easily is one of my biggest weaknesses in XC flying. For this flight, I had to call on all my determination and concentration so that I didn’t just give up. I tried something, risked failing, learnt a lot and achieved something genuinely difficult. What a day! After three pretty epic days with masses of flying, I think the whole comp is pretty relieved to have a day off today. 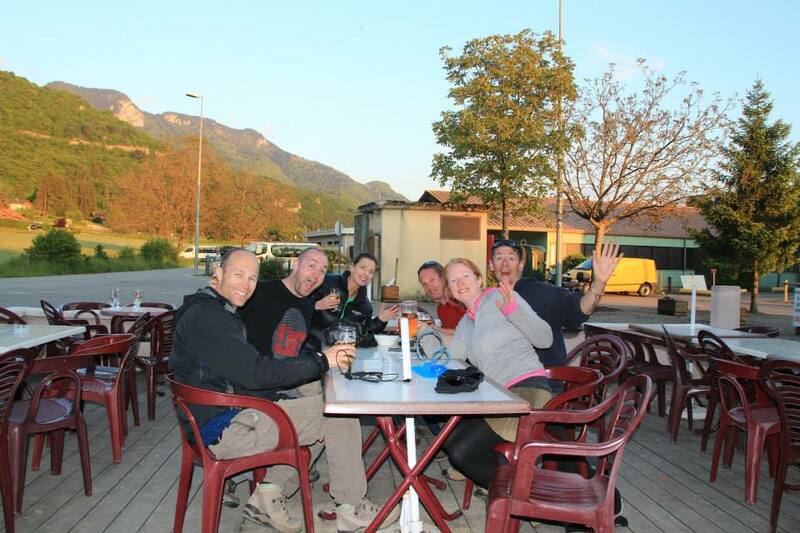 On Monday, the forecast was for a pretty much perfect Chabre day – light southerly winds and high cloud base. 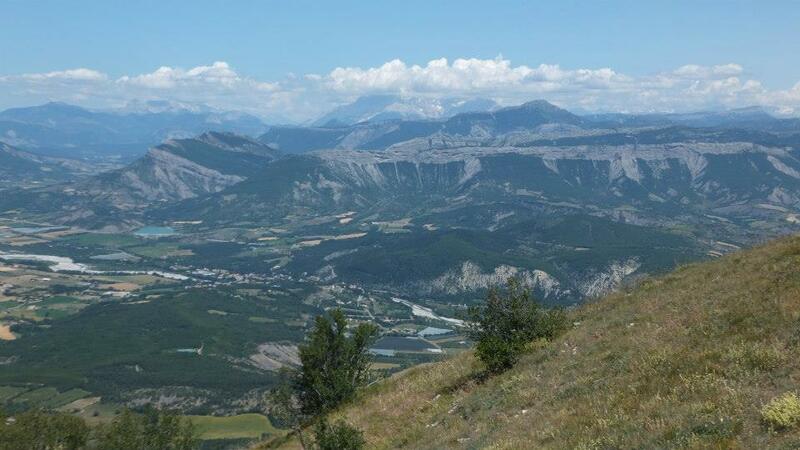 Our lovely task committee came up with an interesting task to get us to Aspres – a 50km route via a point on the Chabre ridge about 5km to the west, Orpiere to the north, then east to the far end of “the volcano”. For me, the most challenging part of the race was the start – an hour on the ridge before we could enter the start cylinder. This is fairly usual for competitions, but I wasn’t prepared for it – all I could think about was my hungry belly and having to wait until 2.15pm when we’d be off on glide and I’d be able to faff around and get at my lunch! Finally, 2.15 arrived and off we went! Hands off, lunch out, eaten and time to focus back on the race! I clipped the first turn point at Orpiere in what felt like a good position. I pushed on to the volcano looking for lift to top up on the way, but didn’t find anything. Having just missed goal the day before, my strategy was to fly conservatively and get as much height as I could. So when I reached the volcano, I took my time to look around for another climb, rather than pushing on for the turnpoint. After finding nothing workable on the corner of the volcano, I saw Chris White climbing on the tandem further back. As I went to join him, he pushed out, and I scrabbled around not able to connect with anything there either! Seeing pilots struggling on the front ridge, I was beginning to worry a little. There was obviously no point going back the way I’d come, so I carried on along the rising ground, keeping an eye on my escape route over the back of the volcano. 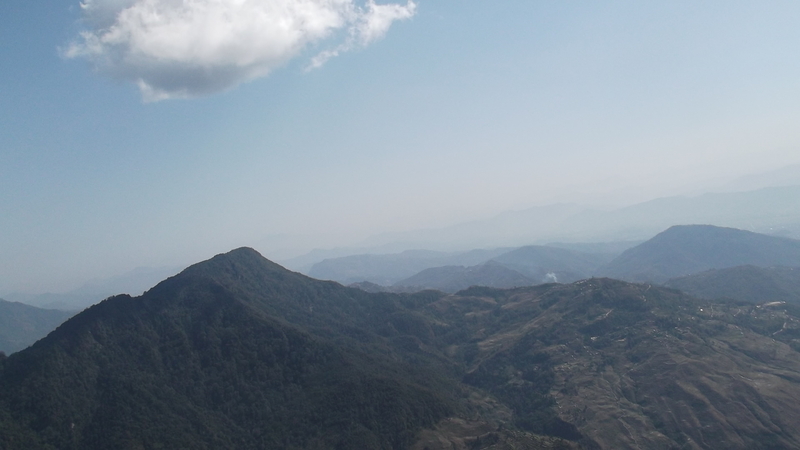 But when I reached the high point, I was rewarded with a strong climb all the way to cloudbase at about 2800m! It felt like I was a long way behind by now though. I was flying on my own watching pilots heading off towards goal as I bumbled along under the cloud in the other direction to get the turnpoint. I’d planned to take the same cloud street back towards the goal, but drifted slightly off course and lost a bit of height on the way. But one ratty climb halfway put my glide to goal at about 2:1. Here being conservative paid off – otherwise the wicked sink and a slight confusion with my instruments could have left me scrabbling over Aspres town struggling to get up to get the final turnpoint. Sorry – no pictures today. I was too busy flying! OK, I’m a day behind with posting now. That’s the problem when it’s flyable – so busy! Sunday’s challenge was a 40km elapsed time task. With a fair bit of north wind still around after the Mistral yesterday, we were flying from Bergies near Sederon. 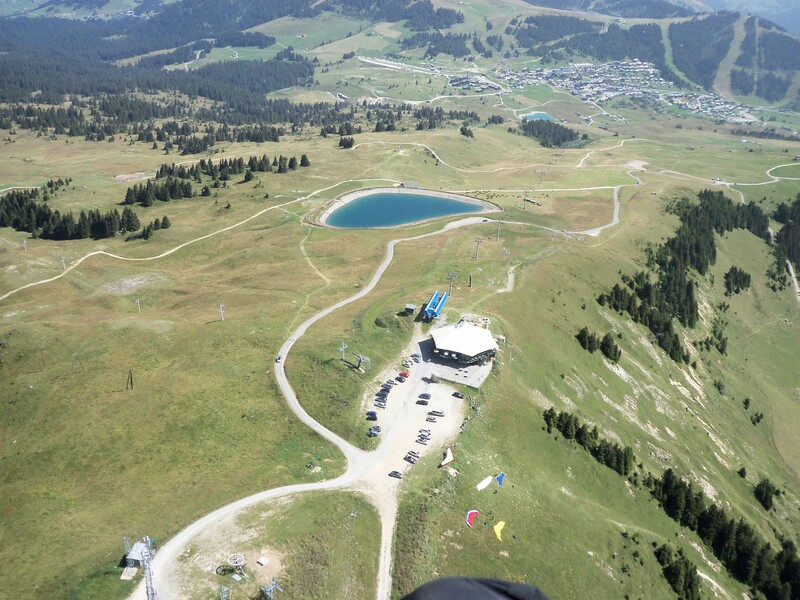 This in itself was a plus for me – I’ve flown around Laragne a fair bit, but this is one site I hadn’t flown! Catching the first thermal is known as a challenge and several good pilots were quickly in the landing field. Those who were lucky enough to get up and away enjoyed smooth strong climbs up to base at around 2300m. It was a fairly straightforward task – two turnpoints and goal back in Laragne. A massive proportion of the pilots were downed by an into-wind leg on the final glide into the landing field. But with nearly 40 pilots in goal and lots of happy faces, it really was a great day. Highlights for me were flying (and getting away from) a new site, bobbling along under a cloud street for several km and and seeing one of my best mates get into goal for the very first time! 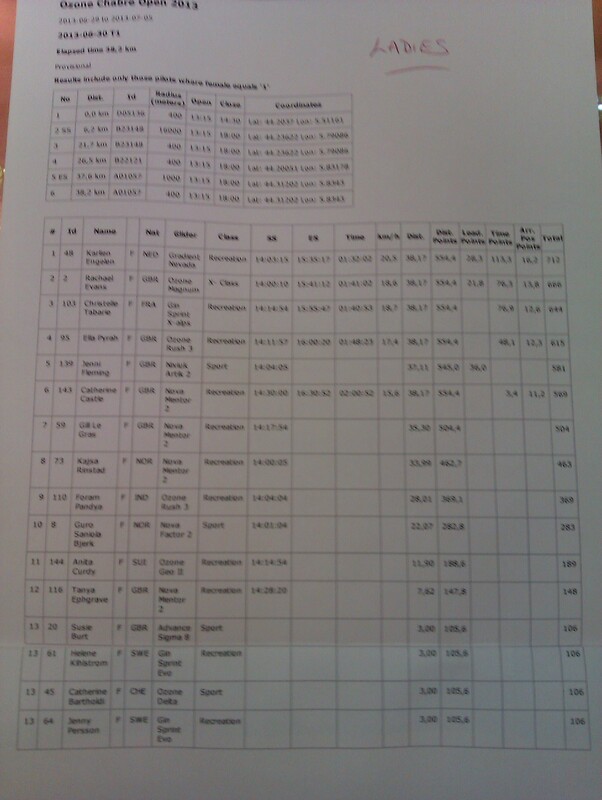 As for me, at the end of the first task, I was 5th out of the girls and a fairly respectable 36th overall. I was one of a mass of pilots landing about 1km short of goal. If only Jockey’s transmission warning of a low level north wind had come two minutes sooner! I learned some good lessons from the day. Most important, it’s that you have to keep working all the way to the end! Don’t assume you’re going to make it into goal until you’re actually there as you never know what’s going to present itself! So next time, I’m going to try and look at goal as just a waypoint on a longer flight, aiming to fly high over the top of it… And who know where I’ll end up?! EDIT – OK, so we’ve already flown the second task before I got chance to post this, but no sneak previews, otherwise this will never get posted! 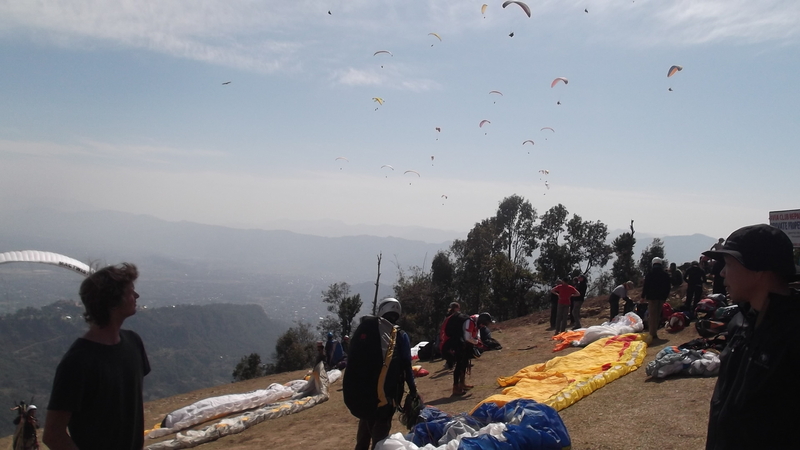 While I was in Pokhara, I took part in my first competition – the 13th Nepali Paragliding Open. I didn’t do quite as well as I’d have liked, but it was a great experience. Everyone’s heard about the perils of competition flying and it put me off for a long time. When I went to wind dummy for the Women’s Open in August, I chose not to compete. I was uncertain about what a competition involved and I was reluctant to put myself in a situation where I would be pushing myself to much. But I liked what I saw there and I’ve learnt a lot in the past few months and know there’s a lot more for me to learn, so why not? 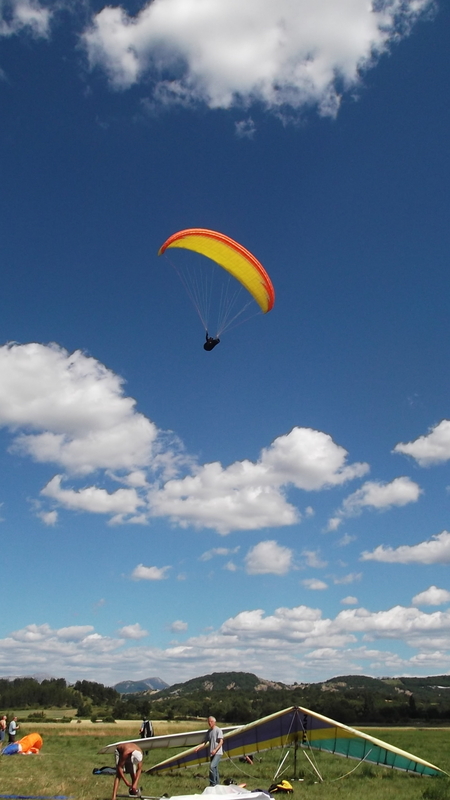 At the moment I can do a 30 or 40km flight without too much problem, but I rarely go further. I fly in a relaxed way, climb as high as I can, take my time deciding what to do next. But if you want distance (or to fly with friends with more experience on hotter wings), this doesn’t always work. You need to be able to make the most of the conditions when they’re right, or if, like me, you only have the stamina for a 3-4 hour flight, you need to move more quickly if you want to go further. I got to see the difference competing could make to my flying on the first day – competition flying is all about moving quickly. 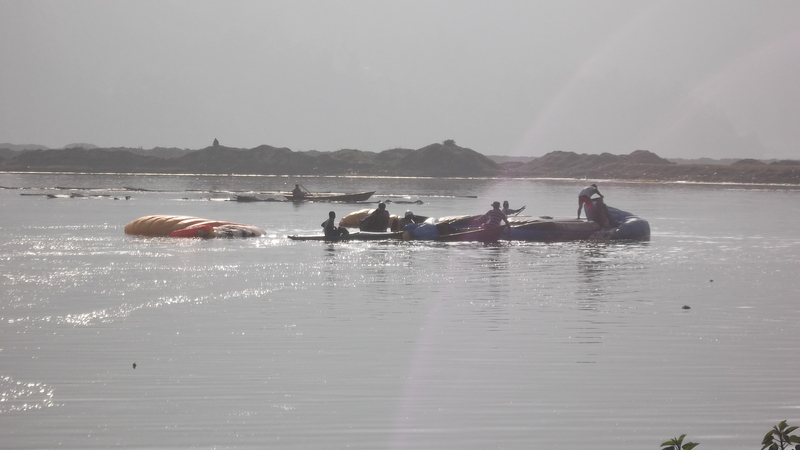 The less than perfect conditions posed a challenge for the task setting committee. But the ridge based task for sports class (the lower category of wings) was pitched just right. I took off a bit too early, climbed to the top, then had to wait it out in a crowded sky until the start. Hating the crowds, I pushed out, losing height, but picked up another quieter thermal which brought me back above the start just a minute before the race began. When I left the house thermal, lower than some of the others, I was more trying to get away from the crowds rather than get a racing lead. However, I soon realised that flying to avoid the crowds meant I was holding my own in the front gaggle. Initially, I was frustrated that the same wing was always in my way when I wanted to turn in the lift. Then I realised he was simply racing, only stopping to climb when necessary. Aha – tactics! I hadn’t thought of that! So I push on along the ridge, keeping as much height as possible and soon tag the first turn point. Sometimes while flying, I still get nervous when putting on my speed bar, even though I know from experience how solid my Epsilon 6 is. But in the race, with so much else to think about, I suddenly realised I was using the bar, adjusting for lift or turbulence, without even thinking about it. So much of my attention was on the other pilots around me, other hazards, the best route to the next turn point, etc, etc, that the business of just flying the wing was instinctive. A year ago, I had done one “XC” flight (if you can call it that) – a 7km downwind dash in Algodonales – so I still find this feeling of being a real pilot quite a novelty! But it’s thanks to putting myself in different situations like this competition that I’m getting to experience that feeling. Coming back from the first turnpoint, I take the first good climb as high as I can to fly back along the top of the ridge back on one straight glide back into the house thermal. 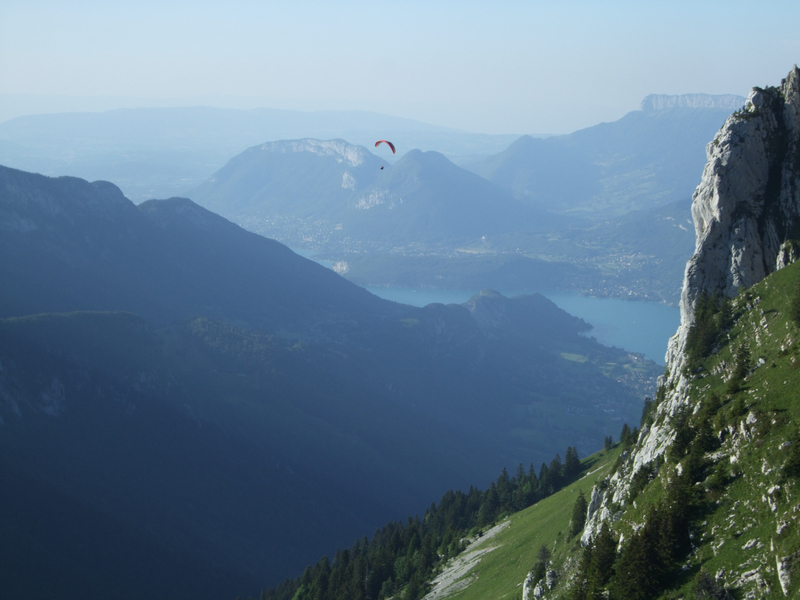 Using all my patience (a skill I’ve learnt while flying with some of the great pilots that come in and out of Maison du Moulin in Annecy), I make myself stay there until I see the lift is working most of the way to the next turn point. Then I leave, making the turnpoint and back to the house thermal without needing to stop. But getting back to the house thermal low, ignoring good lift on the way back, I’m worried I’ve made a big mistake as I now need to find something quickly! But with a bit of luck, a strong climb kicks off exactly where it should be and up I go! The rest of the race is a repeat of the ridge run from the beginning. Confident with this now, I set off on bar, only stopping to top up my height when I need to, tagging the final turn point with two Nepali pilots. As we race to the finish in relatively smooth air with masses of height, I stand on the bar and push towards the finish, thinking I’ll get in ahead of both of them. But I didn’t feel too bad when the Factor 2 to my left suddenly pushed out and left my much slower wing for dust, easily beating me to the finish, particularly when I find out I’m the first girl to complete the task and fourth overall – not bad for my first task of my first ever comp! But I also got to see how easy it is for pilots in competitions to push it just a little too far, with two pilots ending up in the trees – at least one of which, a good pilot with lots of local flying experience, was because of flying into rotor on the leeside of a ridge. 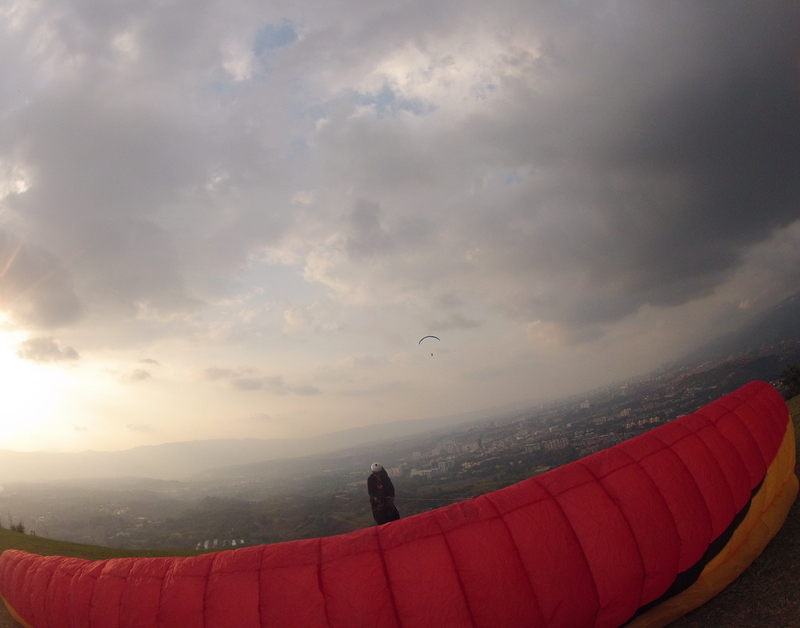 The next day, the task was cancelled because of low cloudbase. Day three gave us a longer task. 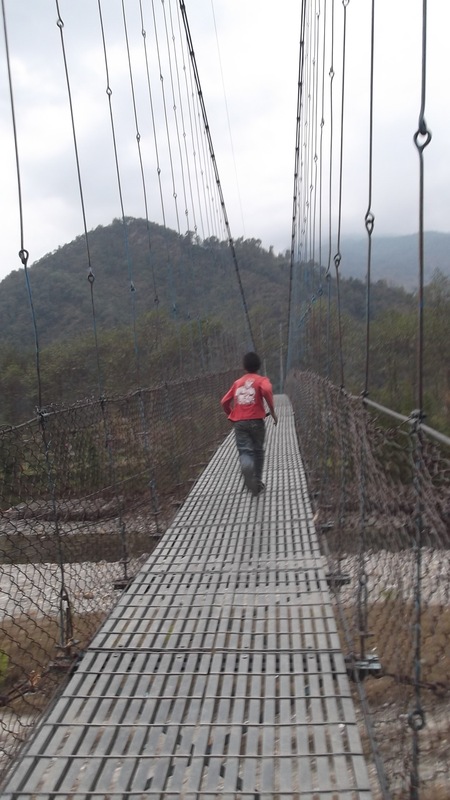 While the big boys in open class headed off on a 60km route around the Korchon circuit, our sports class task was just over 30km, involving a short ridge run followed by a circuit of the Green Wall, one of Pokhara’s classic XC routes. Determined not to make the same mistake as the previous task, I waited to take off until about 15 minutes before the start. However, with a little bit of faffing on my part along with waiting my turn on launch, I ended up in the air just five minutes before the start, scrambling with 30 other pilots while waiting for a good cycle to come through. By the time I got high enough to go, I was already 15 minutes behind the other girls. Trying to play catch-up, and keen to get away from the crowds as ever, I pushed on a bit low and ended up scrabbling again for a climb, which when it came, took me back to the ridge, but further west than I wanted. This meant I had to leave the climb and make a short push into wind to tag the next turn point. By the time I was leaving the ridge, I was nearly 45 minutes behind the rest of the girls, and Jessica, who went on to win the task and the competition, was already on glide back to Sarangkot before I’d even hit Green Wall. The superior glide of her Factor 2, coupled with the increase in the valley wind by the time I was coming back meant that while she made goal with height to spare, I was packing my wing behind the ridge. The next day, my friend Emily lent me her Mentor 2 to help overcome the difference of the performance in wings. But the decision backfired. A much more technical day, with small weak climbs, I would have been better off on the wing I know. After two hours fighting to get above the ridge, I realised that even if I did get away, I was now so tired that I would struggle to make the course. Admitting my competition was over, I headed for the landing field to nurse a splitting headache and slight disappointment at turning the first day’s victory into a decisive defeat! But overall, I wasn’t really disappointed. I’d flown well most of the time and learnt a lot. Being able to fly the same routes as pilots on a similar level and later compare our routes, our good and bad decisions online using Xcontest was invaluable for seeing how I could improve my flying, and less than a week later, I went on to complete my first ever 50km XC flight. And now I know that when it comes to competing, as long as I can learn to be consistent, I stand a good chance of getting some decent results. But even for those who aren’t interested in winning, I think competitions are still a worthwhile exercise. You get full briefings on the sites. You get lifts to take-off and retrieves. You get routes set out for you. You learn from much more experienced pilots and discuss ways round the route, things to look out for, information on what works and doesn’t. That said, it isn’t for everyone. You’re flying busy skies, sometimes with pilots who are there to prove something and fly aggressively. And however hard you try to tell yourself and others: “I don’t want to win. I’m just here to fly,” as my friends would willingly confirm, it’s human nature to feel the stress of being in a competitive situation. But for me, I think I can enjoy the flying while using competitions to improve my flying, hopefully even getting a few good results on the way. 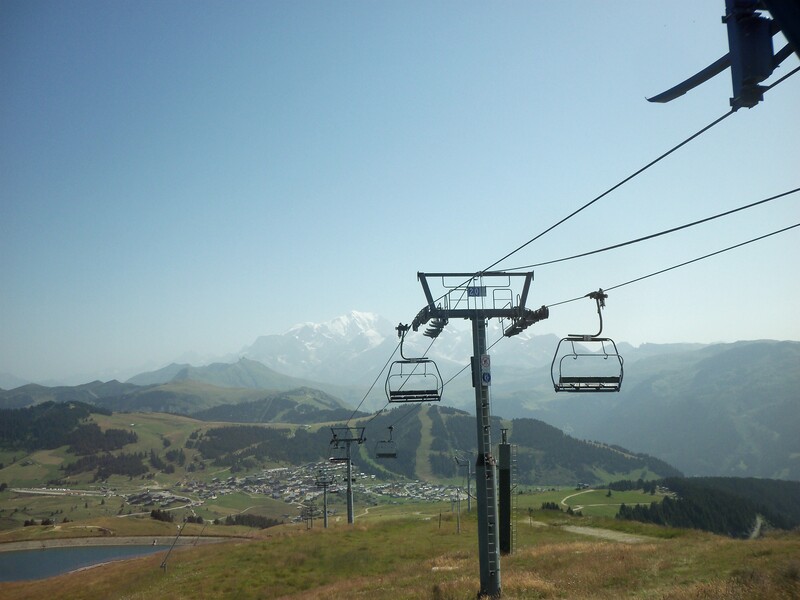 I went back to Les Saisies on Monday after an amazing flight the day before. It’s a beautiful site with take off just under 2000m above sea level, almost in the shadow of Mont Blanc, with the Aravis chain behind. The wind felt better than the previous day – straight on the hill and consistent, with a few nice thermals coming through. No-one was staying up yet, but after watching for a while, I decided to get my wing out. I suspected that they weren’t really trying, generally turning away from the house thermal as soon as possible. As I was making my final checks, one glider finally went for it and turned right from take off and stayed up. Relieved I wouldn’t have to be the one to make the first move, I followed quickly and found strong lift everywhere! 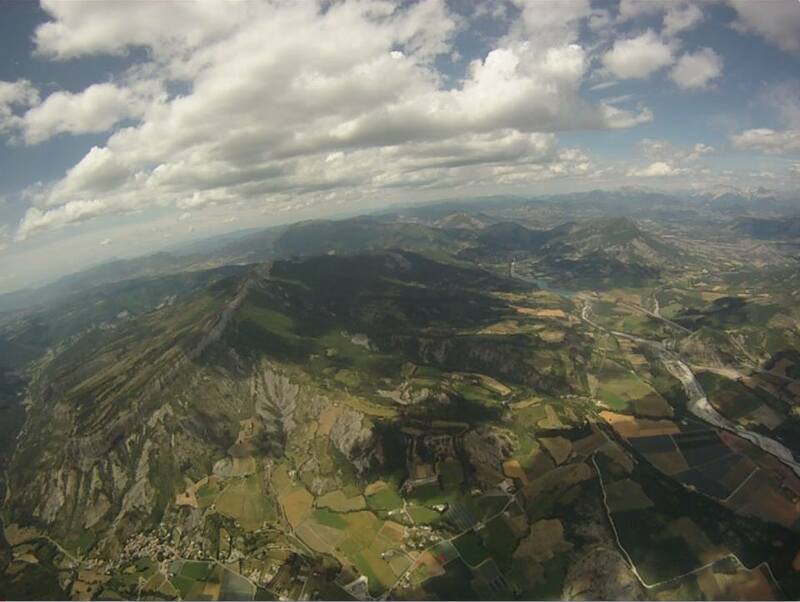 Yesterday, my flight had ended as I’d wasted my height searching unsuccessfully for a climb above Rochebrune meaning that once I crossed the valley, I was scrabbling low for a climb, having to constantly watch the power cables between me and my landing options. 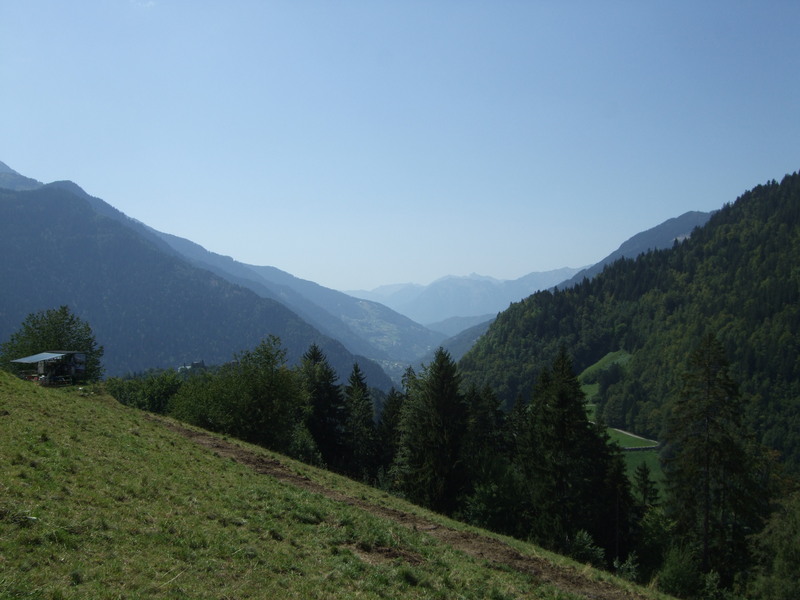 If I got the same height today, I’d head straight across the valley and try to climb up onto the Aravis, then head towards Passy and possibly on towards Cluses, where dinner would be served later. And today, things seemed even better than yesterday! I began to get excited – the climbs felt similar to the day before, but I was soon well above the height I’d made on my first climb the previous day. I made slow progress – my glide was interrupted as the lift was everywhere, tempting me to stop and turn and top up my height. But not a problem – one of my mistakes the previous day had been to rush, landing before 2pm when the day was probably just getting going. The day before I’d only made the lift station on the other side of Les Saisies town – the next reliable thermal marker – because I’d found a climb from the bowl in front. This time I arrived with masses of height. The climbs were strong, but broken, so I lost them several times and had to search around for lift, but I was generally getting higher, so not particularly worried. Finally I drifted back a bit and found a much easier climb and wound myself up to 2,600m. The fact that this climb was better further back should probably have warned me that the next climb wouldn’t necessarily be so easy to find as the previous day. But so far there had been lift everywhere! While it wasn’t necessarily easy finding the best bit, going up was not a problem. So I headed straight for the next lift station, a usually reliable thermal source. I slowed for a couple of bubbles of lift, but didn’t stop, expecting a good climb ahead. Nothing! Going past the lift station, there was still nothing. I was getting low now and needed to make a decision quickly. I was too low to go back the way I’d come and see if I could make anything of the last bubble of lift I’d come through. I should probably have turned north towards Flumet, but thoughts of flying down an unknown valley and how to get back if I bombed out stopped me. So I turned south to fly over the plateau where I’d found lift yesterday. The cows watched lazily as I put my feet down ready to land and take off again if I couldn’t clear the hillock they were grazing on. They didn’t bat an eyelid as I picked my feet up and sailed past them, just clearing the ground. The gently sloping plateau in front of them kept giving me pockets of lift, which made me think I was saved, until I lost them and lost as much height than I’d gained getting them back. Being patient, lurking, keeping on working the scratchy lift is something I’ve been training myself to do. But I didn’t do this today. The birds seemed to be doing the same – working a patch of lift for a couple of minutes, then going off to find something better. The next possible lift source was always so close that I went looking to see if it would be better. And it was! But I was below the level of the ridge now, and climbing up above it proved impossible for me – as others had found earlier in front of take off. Carrying on along the ridge, I could see the valley ahead with the official landing just beyond the town. I was surprised the valley wind was weak, with the trees below me showing no sign of a breeze. I found one promising bit of lift which I worked for a while, pausing to politely return the wave of the holidaymakers in the houses below which were helping me climb. But like everything else I’d found as I flew along the ridge, it only took me so far – not enough to get back up the hill, and my general direction of travel was still downwards. However, as I flew back and forth over the holiday homes, I had chance to look again at the ridge and the valley ahead of me. I realised that the valley I was looking at wasn’t the one with the landing field in, and that the reason I wasn’t feeling a valley wind was that I was sheltered from it by the outcrop I would have to pass to get to the landing field. But if there was a strong valley wind, it would be rough as the wind swirled round and over the outcrop. When another bubble of lift took me up, I felt the first bit of rotor and immediately turned and fled for the other side of the valley, my suspicions confirmed and a valuable lesson learnt. I reached my chosen landing field and found the true wind, which left me barely moving forward for a moment. I decided not to try and work the lift over here, tired of fighting to stay up and relieved to be safely away from the rotor on the other side of the valley. The cows in this field did what cows always seem to do, and watched lazily as I came in to land next to them, then sloped off to give me chance to pack up my glider. No sooner had I unclipped than my phone started ringing. Freddy and Becca had watched my retreat from the rough air and graceful landing across the valley and were almost immediately on their way to collect me – a gold plated retrieve service! I got another lesson in Alpine weather as the evening came and the thunder started in the Chamonix valley about 6.30pm, shortly followed by torrential rain and gusts that brought down trees. I resisted the temptation to comment on a picture posted on XC Mag’s Facebook page from someone flying over Mont Blanc at 6.30pm – maybe they were flying with earplugs in as the thunder must have been pretty loud from there!